Cast members of “Urinetown” at the OB Playhouse. A mega-corporation, Urine Good Company, or simply UGC, controls all citizens’ excretions. And if someone can’t pay, it’s off to Urinetown … from which they never return. “Urinetown,” the Tony Award winning musical that premiered in 2001, is a funny, punny satire that takes potshots at everything from capitalism to corporate greed, crooked cops and politicians, warped justice to populism, and a people’s uprising/revolution, which doesn’t turn out to be the panacea you might expect. So everyone takes it on the chin. The timely relevance comes with a cautionary tale. Bobby Strong (wild-eyed Joey Kirkpatrick, who looks a little psycho at times), always has his “head in the clouds,” but he’s more or less grounded in refusing to accept the status quo — especially after a pee-fee hike is announced, and his father is dragged off to the dreaded Urinetown. Then Bobby meets the naive ingenue, Hope (pitch-perfect Evelyn Sparks, a recent grad of the San Diego School of Creative and Performing Arts), and he realizes that he has to “follow his heart” and lead the revolt, while falling in love. It turns out that Hope is the daughter of the founder of UGC, possibly the most corrupt capitalist on earth (his “Don’t Be the Bunny” kill-first philosophy is chilling but hilarious). The people revolt, Hope is held hostage, Bobby is dragged away and… well, you’ll just have to see it to find out how it all unfolds. Our comical meta-guide to the mayhem is Officer Lockstock (amusing, mustachioed Danny Ingersoll) whose sidekick is Officer Barrel (agile, funny Todd Sutton). At the OB Playhouse, director/choreographer Jennie Connard has done a bang-up job. Her cast, though variable, makes up for the occasional lack of nimbleness with superb singing. There are side-splitting references to other musicals, with two particularly terrific scenes featuring “Fiddler” moves and a “Les Miz” march-with-flag-waving (here, of course, a yellow flag). Musical director Kirk Valles conducts (and plays keyboards for) a fine six-piece orchestra. The costumes (Ellie Lippitt) are spot-on. Lockstock and the street urchin Little Sally (effective Daryl Daley) guide us through with insider theater talk (“Nothing can kill a show like too much exposition,” he solemnly instructs us). The book and lyrics (Greg Kotis and Mark Hollman), with music by Hollman, are catchy, clever and memorable. Both the book and the score won Tonys. The title can be so off-putting that the show isn’t produced that often. It should be. Especially now. Hats off to the OB Playhouse for taking the risk. The community seems to be soaking it in. You gotta go, too. 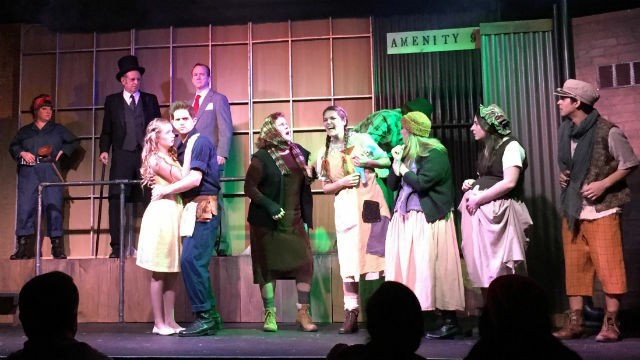 “Urinetown” runs through March 12 at The OB Playhouse and Theatre, 4944 Newport Ave. Note: The OB Playhouse is raising money and awareness for the legal defense fund for #NODAPL. A portion of every ticket sold will be donated to the cause, and there’s a donation drop-box at the theater. At the Pay-What-You-Can performance, they raised more than $1,000.